Well after weeks of hard work, Rumorbuster 2.0 is ready for launch. It's only a sample of what's to come but we're still building. In the meantime, we've had a good run over here on Blogger, but it just isn't scalable for the plans we have in store. Galleries, space for comments and discussion, and more on the way. From the Omelete site comes this Google Translated page that doesn't say much (at least not much in translation) about the series, but does offer some handy promo art featuring... Ms. Marvel! First image, top corner, below Hulk and Thor. The Hulk SHS set Brawl that Shook the World is in Toys R Us's 2-day sale, marked down to $14.99, apparently with free shipping if you use their website. Not a bad deal for 4 figures and the "sonic tank" and those that have held off on buying a repaint set. And Toy News International has posted shots of the Defense of Oa set. If only the Battle-Damaged Manhunters could have been differently damaged. John Stewart is listed as an exclusive figure, so apparently there's no plans of him being released individually, at least not for a while. Wow. There is just so much that this person just doesn't get. 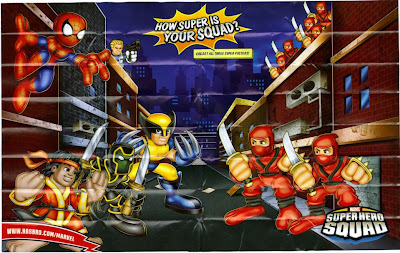 Like, for instance... can someone describe how, exactly, the Super Hero Squad is "scary"? And isn't suggesting that kids will just "grow up thinking that Earth's Mightiest Heroes is made up of midgets and little people" kind of silly? A little like suggesting kids should never see the Sunday comic strips because Charlie Brown is a short, fat little kid with a huge head? They should probably stay away from cartoons involving animals as, by that logic, kids will grow up thinking dogs, pandas and hedgehogs can talk. And the shocks in store when they find out that plumbers don't grow after running into magic mushrooms. Suggesting that kids are going to be in for a shock when discovering that "regular" comics (and what, tell me, is "regular"? Only mainstream comic characters? Only characters from the Big 2? Only top-tier characters from the Big 2?) don't look like the Squad is an alright proposition, but honestly, not every representation in "regular" comics will look like a Simon Bianchi cover. That's like suggesting Bill Sienkiewicz should never have been involved with such classic stories as Demon Bear-era New Mutants or Elektra: Assassin because it wouldn't look like most other interpretations. Or, on a similar argument, suggesting that only artists with narrow ability to mimic the style guides should have employment. Goodbye Chris Bachalo, until you learn to conform! Zeb Wells you are on notice! Anyway, I'm sorry Mr. McMillan thinks the Squad is Marvel's torpedo, diluting their strength, scary, and weird. Oh, and families... if you visit the article, be wary of the comments. There are some people who just hate cute. Hasbro seems to be trying to unload those Wave 1 sets sitting around the warehouse with a Value Pack of 7 sets from Wave 1 and 2. Well as posted earlier, Danger of Dreadknight and Iron Monger Attacks contain new posters featuring several of the new characters (Ronin, Shang-Chi, Electro, Green Goblin, Nick Fury and the Skrulls) so hopefully we'll get full scans up this week. In the meantime, gaze as Shang-Chi, Ronin, Spider-Man, Wolverine and generic SHIELD Agent (or perhaps, an easy way for semi-obscure character collectors to pretend they haveClay Quartermain?) as they take on a handful of Photoshop-cloned Hand Ninjas. New Fantastic Four and Defenders revealed!